Did the Rubik’s Cube, one of the world’s most deceptively simple puzzle games, need to be turned into a handheld gaming device? I initially thought Super Impulse’s new Rubik’s Tilt game was a gadget the world didn’t need, but it turns out there’s one feature a cube-solving amateur like myself is happy to finally have: hints. Similar in size to the original Game Boy Advance, Rubik’s Tilt features a much smaller screen and just a single pre-loaded game: a digitised version of the Rubik’s Cube that appears to float in a black void. In a time when your smartphone has access to millions of games, including Rubik’s Cube knock-offs, carrying around a purpose-built handheld is a hard sell. But at $25 ( £19) Super Impulse has managed to keep this one in impulse purchase territory. The next time you’re stuck on a long call, you might be happy to have one of these buried in a drawer of your desk. Rubik’s Tilt uses an accelerator and a series of buttons to manipulate the digital cube in lieu of a touchscreen display. 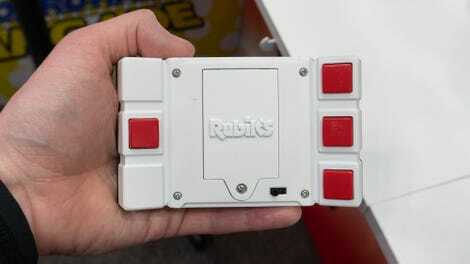 The handheld can be rotated side-to-side, twisted and pitched forwards or back to rotate a section of the cube while pressing one of three buttons on its back that determines exactly which section you’re moving. Holding all three at the same allows you to rotate and study the entire cube. It’s a little complicated to explain, but with the device in hand it took only about ten seconds to figure out the controls, which feel quite intuitive once you do. 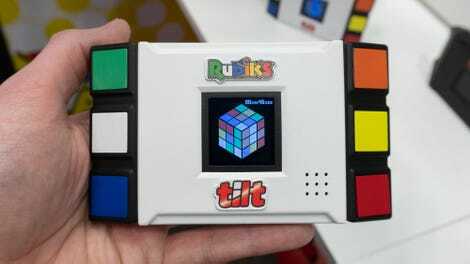 Aside from being a little easier to pocket than a standard-sized Rubik’s Cube, the Rubik’s Tilt handheld introduces a couple of other improvements that those of us who are terrible at solving those multi-coloured nightmares will appreciate. For starters, there’s an option in the handheld’s settings to offer hints on what section to rotate if there’s been no moves made after a certain amount of time. Some might consider that cheating, but it’s better to think of it more as a learning tool for players looking to improve their puzzle-solving prowess, instead of just getting stuck, frustrated and giving up completely. With the original Rubik’s Cube there are essentially two outcomes: you either solve it or you don’t. There’s really no middle ground, which can be discouraging for beginners who don’t know if they’re any closer to solving the puzzle than during their last attempt. To provide more incentives to keep at it, Rubik’s Tilt not only times how long it takes to solve a puzzle – giving players a definitive metric on their improving skills – it also provides achievements along the way. So even if a player doesn’t solve the entire cube they’ll still have a sense of their progress, and whether they’re any closer to solving it.